Read Pete’s discussion of the BioPLAY Games. The graphics are high-quality but the processor demand is light. The games have levels of increasing difficulty. There is a high score function that allows competition between trainees. The BioPLAY game requires three inputs from the EEG or other physiological signal. Each input controls a different function of the game. For example, the pass/fail output from your BioExplorer threshold would shoot the dart. Meeting a higher threshold would increase your points. And the percent of time over threshold would increase the power of the dart. The games vary in the extent to which the mouse and arrow keys also control aspects of the game. 5 easy to moderate games. Simple use of mouse and arrow keys. •Gold Fishing: Hook the gold pieces to earn points. •Crazy Taxi: Drive fast to beat the timer, jump over other cars. •Hare and Tortoise: Guide the tortoise to beat the rabbit to eating the flower. 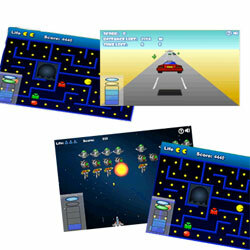 •Space Invaders: Dodge and shoot the invaders before there is a landing. •Wizard Balls: Your magic rays will destroy the balls. Don’t let them hit you. 5 moderate to high-skill games. More complex use of mouse and arrow keys. •Ghost Man Advanced: Use your arrow keys to eat all the dots while avoiding the ghosts. •Balloons: Use your mouse to aim your darts to pop all the balloons. •Slingshot Challenge: Aim at the can with your mouse to keep it in the air. •Bubble Bug: Capture bugs inside your bubble. •Protect Mission: Protect your medic wagon from bullets, while advancing on the field. Instructions for adding BioPLAY to your Software. When you order, select your game pack then select which platform you are using (BioExplorer, Infiniti, BrainMaster). After your order you will receive an email with download instructions.